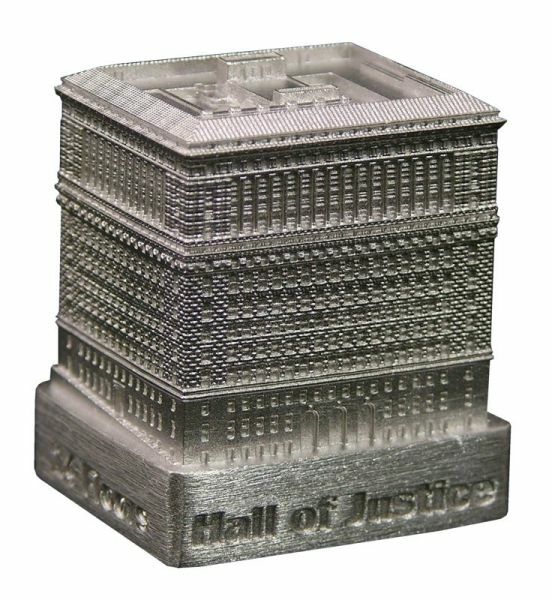 The Hall of Justice is located at 300 N. Broadway in Los Angeles, California and was completed in 1925. This building was designed by Allied Architects, Nadel Architects Inc and Nakada & Associates and stands 164 feet tall with 14 floors. This is the oldest building in the Civic Center and the location of many well-known trials including Bugsy Siegel, Charles Manson, and Sirhan Sirhan. This pewter replica stands 1-1/2 inches tall and is finished in new pewter. This model's scale is 1 inch = 150 feet. I agree totally with the previous review of this building. A must have!